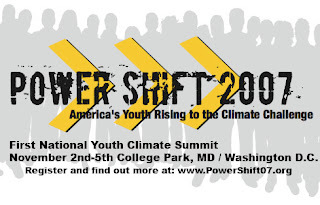 WattHead - Energy News and Commentary: Generation Anything-But-Quiet: Just Wait for the Noise at Power Shift 2007! If we want a green future, gotta take our power back from the politicians and big oil now! 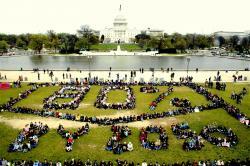 Now's a critical time to lobby Congress to adopt a strong, clean Energy Bill for 2007. We can't let there be any compromise on the Corporate Average Fuel Economy standard of 35 mpg by 2020 or the Renewable Electricity Standard that calls for 15% of U.S. energy to be generated from renewable sources. These measures will help save Americans $25 billion in gas costs, save 1.2 million barrels of oil a day, and prevent over 200 million tons of greenhouse gas emissions each year.